Fashionable acrylic nails have been all the rage lately. Gone are the days when a popping shade of nail polish was the only accessory to jazz up your nails. Now people are going all out and nail extensions are becoming exceedingly popular. If you’ve had your nails done professionally, and you’re thinking about doing them yourself, give it a go. 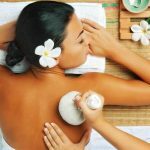 You’ll be surprised how simple and rewarding – and of course, money saving it can be, and friends and family will soon be asking you to work your magic on theirs. Who knows, you may even turn it into a new career! What makes acrylic nails different? Acrylic nails are artificial nails that are applied on top of your natural nails. Tough and durable, they are perfect if you have weak nails that break easily or you have a tendency to bite your nails. They are available in standard and long sizes, being trimmed and shaped to suit your preference. Acrylic nails can make a real difference to your hands, and you’ll feel proud to show them off. 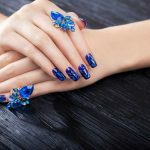 You can enhance your nails with gorgeous, glossy colors, apply crystals or other types of sparkles, and designs – the only limit is your imagination. These BeYou nails feel extremely durable and a good thickness. Being long, there’s plenty of scope for shaping and filing. I had great fun with these. They are so easy to fit and stick, even with minor prepping of my natural nails. Filing is simple, with just a tiny bit of shaping necessary. The nail polish went on so smoothly, and once a top coat was dry, they looked absolutely amazing! They stayed in place for well over two weeks, too. These acrylics are great for a quick fix up or for beginners. However, they are a little on the flimsy side, which means that they won’t last as long as more expensive alternates. Still for good acrylics on a bargain, you can’t go wrong. These are really great acrylic nails – easily filed and stuck, and they stayed on for nearly three weeks. Perfect for a quick and easy home manicure. This little bottle of magic is necessary in order to glue your acrylic nails on to your natural nails. The nozzle is nicely shaped to deliver an accurate line of glue – not too much and not too little along your nail. The only drawback is that this nail glue has a strong smell to it, but as long as you work in an airy space, you will hardly notice. This nail glue is perfect for acrylics – and definitely one for the nail kit. Shipping ahead of time, these coffin shape nails from ECBasket feel like they should stay in place nicely and be durable enough to withstand the rigors of day to day life. These beautifully shaped nails coped well with being trimmed, filed and even having a piercing without splitting. I thought I’d also try out a bit of bling and the whole thing stayed firmly attached to my natural nail. Shaping these acrylics to fit the smallest nails takes a little practice, but with a little patience, you’ll soon get the hang of it. A really good set of acrylic nails, cheap enough to be used daily, but tough and durable to last several weeks. ★Stiletto Shaped Design ★The long stiletto nails with bags designed with natural and full cover.Easy to apply, file and paint. If you clip the top of the nails , it become coffin shaped nails. You have options to cilp them shaped you like.Nice holding the color without separating or streaking.It's make your nails Fashion, Creative and fresh. I was pleased to notice that this glue didn’t have the eye watering chemical smell that other nail products can have. That’s a great start. This super strong glue works exceptionally well, although you do have to brush it on a little thicker than you might expect; for that reason, I wish the bottle were larger. It still works with a lesser amount, but the bond is not as strong. Once I’d realized that, my acrylic nails remained stuck for over two weeks. It was equally reliable with crystal nail decorations – keeping them in place for the same. A little goes a long way with this super nail glue – so I recommend to use it sparingly. I’m super happy with this glue – it goes on smoothly, forms a really strong bond and is removed easily with acetone. Arriving ahead of schedule, this hard wearing box filled with acrylic nails is great to store them in; there’s also room for some other bits and pieces of your nail art kit. The nails feel strong, but with a useful amount of flex to prevent them from snapping. These Aoraem nails are brilliant. I filed and shaped them to within an inch of their lives and they didn’t crack, split, or bend. The color just slides on so smoothly, and forms a very glossy sheen, and they looked good for almost three weeks until one pinged off. These acrylics are quite long so if that’s the style you’re looking for, you’ll love them! If you like your nails shorter, then you may need to clip them. Tough, but nicely shaped, nails that arrived in a useful storage case, I really recommend these. AORAEM 500pcs French Acrylic Style Artificial False Nails are made with high quality ABS material, which is thick and sturdy enough to last about 2-3 week.It's kind of environmental friendly material, without toxic and will not harm your nails or body. These acrylics feel very strong and have a lovely finish even without the polish. They are excellent quality and fit well without too much shaping. The long set need to be filed down quite a bit, but I knew that would be the case. But even when they were still unfiled, they took being pierced with no complaints, holding the ring really nicely. Don’t be put off by the description! These acrylics are described as “short” but they actually are long enough to suit most tastes. These nails by BTArtbox-Boutique are great. They put up with me filing, shaping and even piercing and didn’t split, crack or break. As a result, I’m happy to recommend these. *Same Price,More Pieces,Varied Sizes:BTArtbox 600PCS Natural coffin nails offers 10 different sizes with 60 nails of each size numbered 0-9.We have written the detail sizes on our amazon page,please refer and check it before you purchase. A pretty power tool – this is fab! It arrived very well packaged with simple to follow instructions, and a whole box of products to get me started. I love this already. Within seconds I was ready to file, engrave or anything else. Subay have thought of everything I could possibly require and popped it in the box. This file isn’t loud at all and the vibrations are tiny, so as a result, it didn’t feel like the nail was under any stress or pressure. This is a great file for a novice, but equally good in a professional salon, and it’s so versatile. This set is ideal for beginners and at home use. If you’re a professional technician, I would recommend investing getting high grade equipment instead. This is an amazing and versitile electric file, and it would make a super gift for a nail art enthusiast. Small and Portable：it is very tiny，suitable for use at Home,Nail Salon or in Travel. Easy to Operate:easy to change drill bit,adjust speed is very simple.Beginner can also choose it. This is mix-your-own-acrylic-nails territory and it’s surprisingly easy, with a huge number of videos to watch giving ideas and detailed instructions. With this stuff you can do whatever you want – your imagination is your limit. You could make pumpkin-like ridges for Halloween, or if you’re an animal lover, mould little paw prints in 3D across your nails. These fun powders are surprisingly easy to use and give a beautiful finish. Just don’t let your kids near it as they will easily spill! This acrylic powder is super fun and easy – making your nails into your own story board. A great buy for nail lovers. Made in USA ! High end quality acrylic nail kit. These appear to be tough and hard wearing. The kit comes with everything I need to create the perfect toenails. I love that my toenails can look as stunning as my fingernails. I did feel they were missing out and didn’t want anyone to think I’d neglected them. With these acrylic nails, I can file, shape and paint them in any way I chose. I can even embellish them with the little sparkles that worked so well on my fingernails. Perfect. The glue that was included kept them in place for nearly two weeks, so I am more than happy with that. My only issue was that there wasn’t a nail small enough for my outside toes which are tiny. I had to file away almost to nothing one of the other ones, so I may not bother with that nail next time. A well-stocked acrylic style pedicure kit enabling you to create perfectly shaped, beautiful toenails. These useful additions to any nail kit arrived on time. They feel well made and able to withstand being used repeatedly. These are a super idea. Gone are the days of sitting with your fingers in a bowl of acetone; these just clip neatly onto each finger or toe and there’s no risk of getting chemicals everywhere. Everything is contained within the little plastic finger clip. After a minute or two, unclip, wipe over your nail and the polish, glue, gel, or whatever has been removed. So simple. I love using these caps to soak off my acrylic nail art but they’re not perfect, so you may need to do some manual top up to get the last bits. Honestly, I love the idea. No mess, no spills, no waiting for ages. These work really quickly and are so effective, I’m happy to recommend. This fast nail polish remover tool allows you to change nail polishes you like anytime, matching different dressing styles. The gel polish remover wrap nail tools are easy to operate for these flexible springs, opening them with a little strength. The slim profile helps to save your space, putting them into drawer or box.